With some movies, you can just tell going in that it’s destined to be a disaster. When you have that premonition during an actual disaster movie, it’s like adding salt (water) to an open wound. And, when that floundering disaster movie is a remake of a mediocre original, you know it’s time to refill your popcorn, because it’s going to be a long two hours. 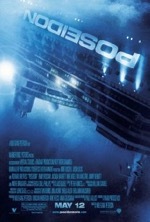 Poseidon, the follow-up to Irwin Allen’s 1972 thriller dubbed The Poseidon Adventure, is such a movie. The original starred Gene Hackman, Ernest Borgnine, Red Buttons, Roddy McDowall and Shelley Winters. The update stars Josh Lucas, Kurt Russell, Jacinda Barrett and Richard Dreyfuss. Clearly the original cast edges out the new crew, but special effects honors go to the new movie. And if eye-popping FX were the only criterion on which a movie is judged, Poseidon would be up for a Best Picture Oscar this year. Fortunately, spectators are also looking for something called plot, a structure quickly jettisoned with the flotsam after the cruise ship is capsized by a rogue wave (okay!) and a handful of brave passengers embark on a dangerous journey through flooded decks and ventilation shafts (one of the only genuinely terrifying moments in the movie) to reach the top of the ship, which is now the bottom. The exterior and interior design of the Poseidon cruise ship is radiant and elegant…it’s too bad we never have a chance to stretch our legs a little (as was masterfully accomplished in Titanic), before the disaster occurs. The movie wastes no time on character development…the ship is upturned near the twenty minute mark, long before we learn that Robert Ramsey (Russell) was a firefighter (Backdraft flashback) and, more importantly, former mayor of NYC. Robert is overprotective of his daughter, Jen (Emmy Rossum); she and her beau are joined at the hip on the ship, but they never find the right time to inform dad that they’re engaged before their lives are turned upside down, literally. There’s a potty-mouthed poker player named Lucky Larry (Kevin Dillon), who could have been a decent antagonist. Unfortunately, he’s killed off before we really even have a chance to start loathing him…another snafu with the script’s cursory attention to character and detail. Dreyfuss, fittingly, plays Richard, an architect who serves as set-dressing and the movie’s token gay person. Lucas’ character is a card hustler named Dylan. Dylan seems to know everything about the ship—he guides the group each step of the way and seems to have the answer for every challenge (he’s even a step ahead of Robert in detecting the effects of a flash fire). Dylan takes a leadership role even though he claims to be a lone wolf…by the end of the movie he learns some teamwork skills, but does anyone care? As the picture’s supposed hero, Dylan fails miserably—the character isn’t noteworthy in any respect and his supreme confidence is off-putting (this is just another in a long string of uninspired performances turned in by Lucas…he’s no leading man). Spoiler Alert: What’s supposed to pass as a major twist near the movie’s end is merely a rehash of Bruce Willis’ heroic demise in Armageddon…Robert sacrifices himself so that Jen and her new fiancé can have a chance to live. It’s ironic, but Robert’s struggle to find the emergency shutoff button, while his body spasms from the lack of oxygen, is the highlight of the movie—Russell delivers the finest underwater death scene I’ve ever witnessed in a film. The movie’s paint-by-numbers conclusion is predictable and unsatisfactory in every way (i.e. there’s a handy raft nearby and the rescue helicopters arrive within minutes). A more interesting climax would have shown the survivors being eaten by some famished sharks…at least that would’ve provided us with some drama. Poseidon is a listing, floundering affair that comes complete with deep water and shallow characters. It works as mindless entertainment, but fails to live up to the original and doesn’t even belong in the same category as director Wolfgang Petersen’s previous sea-faring films: Das Boot and The Perfect Storm. There’s little adventure in this Poseidon! The eighties gave us The Day After, a story about the bitter reality of a nuclear holocaust. Now, the new millennium has delivered us a fresh breed of disaster film in The Day After Tomorrow, which brims with a variety of natural calamities and an amazing array of effects to bring them to life. Granted, the movie is much more enjoyable when you suspend your disbelief right from the opening credits. As unbelievable as it is to accept that global warming can cause an ice age, it's even more of a scientific fallacy to think that an ice age will expend itself after just one week. But that's exactly what happens in Roland Emmerich's (Stargate and Independence Day) big budget, big name flick that stars Dennis Quaid and Jake Gyllenhaal. Here's the Reader's Digest version: Jack Hall (Quaid) is a renowned paleoclimatologist (say that ten times fast and I'll buy you a sno-cone) who predicts a coming catastrophe due to radical climate shifts. Jack's son, Sam (Gyllenhaal), is on his way to New York City to compete in a high school academic competition. Of course, that's when the earth goes into an epileptic fit, releasing tornadoes in Los Angeles, forming massive tidal waves in Manhattan and unleashing uber-blizzards at the poles. The rest of the movie is about survival and the human condition in severe conditions. Jack and his two partners strike out to rescue Sam and his classmates, who have retreated into the warmest room of the New York Public Library and have been burning books to stay warm. Jack's vehicle breaks down just outside of Philly, and he walks the rest of the way to Manhattan over snow and ice in just a couple days (is your disbelief still suspended?). In the end, Jack rescues his son, but the resolution is bittersweet because the northern U.S. is now an icebox. Other than special effects, I don't see The Day After Tomorrow winning any major awards, and there are several reasons why. Even with shallow character development (Sela Ward and Ian Holm were tremendously underserved), a derivative plotline and shoddy science, the biggest injustice in the film is its blatant political agenda. However extreme and speculative, the environmentalists have made their point about the side effects of mass energy usage. The movie became a platform and to its own detriment—The Day After Tomorrow would have been much more enjoyable without the sermon on conservationism. And what about the other message during the reverse-immigration scene, when thousands of Americans flood into Mexico, seeking warmer environs and the ensuing politically correct speech delivered by the newly-promoted president of the U.S.? 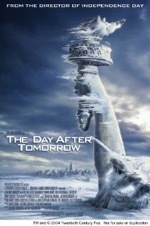 Again, The Day After Tomorrow was a great popcorn movie, but these "preachy" moments made me choke on a kernel. Oh, and one more thing, what business does a wild pack of wolves have roaming into a disaster picture?